We’re a hard working reliable towing provider situated in the heart of Dallas. We have a fully staffed team of qualified roadside technicians that remain available 24/7. That means we don’t take any time off here, especially when roadside emergencies occur every few seconds. We feel it’s utterly crucial to have a well trusted relationship with their towing company. We make it our priority to arrive in less than 30 minutes, so you’re never waiting too long. We rely on safe towing technology to get each job done right. Our tow trucks were built and designed to last. Our drivers know each street and highway in Dallas. On the same note, we use navigation apps to breeze through traffic and show up way ahead of schedule. Our roadside team members will accommodate your vehicle and make sure it gets to your chosen address in pristine condition. Reliability is the key word and we mean what we say! Are you having engine troubles? The nearest service station could be based several towns away, but we’ll help you get there. Our experts will provide your vehicle with long distance emergency towing 24/7, so you never have to abandon your car on the side of the road. Communication skills as mandatory when dealing with accidents or serious collisions. You need to know that help is on the way. 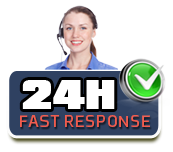 We’ll contact you as soon as we dispatch our trusted technicians. You can’t put a price tag on peace of mind! There might be instances when you might need assistance opening a car door or unlocking a trunk latch. We will send a mobile locksmith to safely pry open the jammed door wedge without breaking the windows. We can also provide you with a quick boost in case your battery is dead. We will pop open the hood and attach the jumper cables to revive your battery once again. Safety comes before anything else over here. You’ll be on your way before you realize it! Captain Towing is Here to Help! If you’re in need a professional tow, you’ve certainly come to the right place! We have decades of combined experience in the industry with an elite reputation to uphold. We work with all major insurance carriers and offer very affordable rates across the board. Let us set you up with a convenient towing date, call us today for further details.